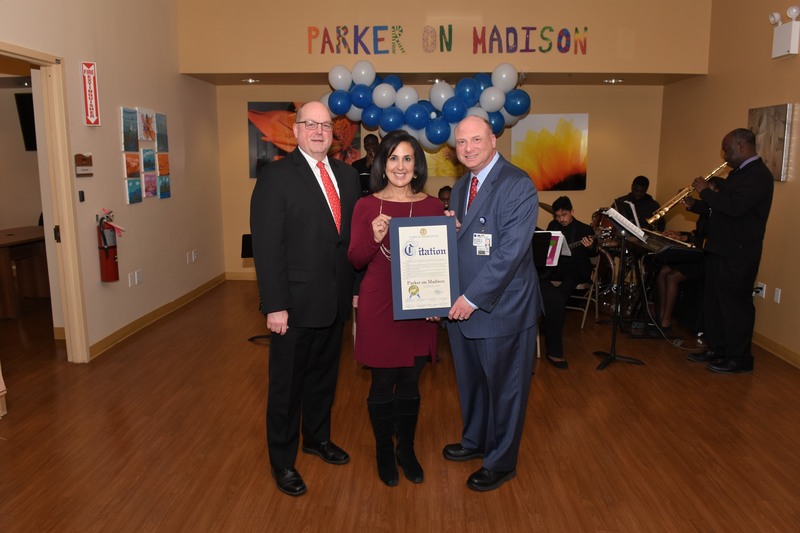 New Hyde Park, NY, April 2, 2019 — Parker Jewish Institute for Health Care and Rehabilitation hosted an Open House at Parker On Madison, Hempstead’s newest Social Adult Day Care Center, on Thursday, March 28, 2019. 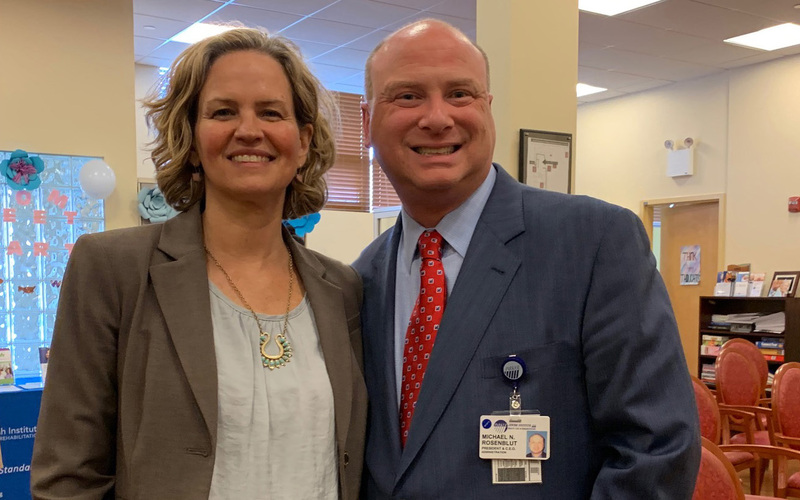 Social workers, health care professionals and public officials, toured the center and learned how it benefits frail older adults, especially those with early memory loss. Parker On Madison was ranked one of the Top Three Social Adult Day Care Centers in the Long Island Business News Reader Survey last year. It is located at 92 Madison Avenue, Hempstead, NY 11550. 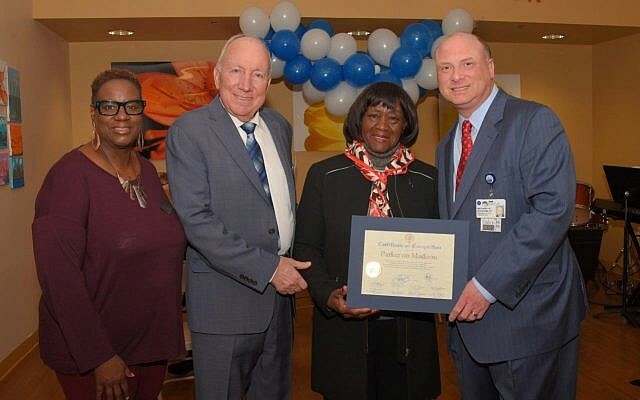 Laura Curran, Nassau County Executive, Dorothy Goosby, Town of Hempstead Senior Councilwoman and Don Ryan, Village of Hempstead Mayor, read proclamations commending Parker Jewish Institute and Parker On Madison, for providing superior services for older adults. Sylvia Cabana, Town of Hempstead Clerk, read a proclamation on behalf of Laura Gillen, Town of Hempstead Supervisor. Jorge A. Martinez, Deputy Commissioner, Nassau County Office for the Aging, thanked Parker Jewish Institute for locating the new program in Hempstead. Plus, the Uniondale High School Band provided musical entertainment! “Most seniors prefer to remain in their own homes as long as possible, while caregivers are finding it increasingly stressful dealing with loved ones’ isolation, nutritional needs, declining health and early memory loss,” said Michael N. Rosenblut, Parker President and CEO. “Our new community-based center is a response to the needs of Nassau County’s frail older adults and their families,” added Rosenblut. Part of Parker’s Community Health Services, Parker on Madison includes a Life Enrichment Coordinator (who is a Licensed Master of Social Work) and recreation specialists. They provide frail older adults socialization, supervision, personal care and nutrition, as well as dignity and purpose in a nurturing environment. These services help frail older adults remain independent and living in their own homes as long as possible, while providing a respite for caregivers. The center accepts Managed Medicaid, , Private Pay and other insurance. To find out how we can help you and your loved ones, please call (877) 727-5373. Town Clerk Sylvia A. Cabana attends the Parker Jewish Institute, For Health Care and Rehabilitation Parker on Madison Social Adult Day Care, Open House. Photo shows the Town Clerk presenting a Certificate of Recognition to Michael N. Rosenblut, President/Chief Executive Officer of Parker Jewish Institute. Parker Jewish Institute, headquartered in New Hyde Park, New York, is a leading provider of Short Term Rehabilitation and Long Term Care. At the forefront of innovation in patient-centered health care and technology, the Institute is a leader in teaching and geriatric research. 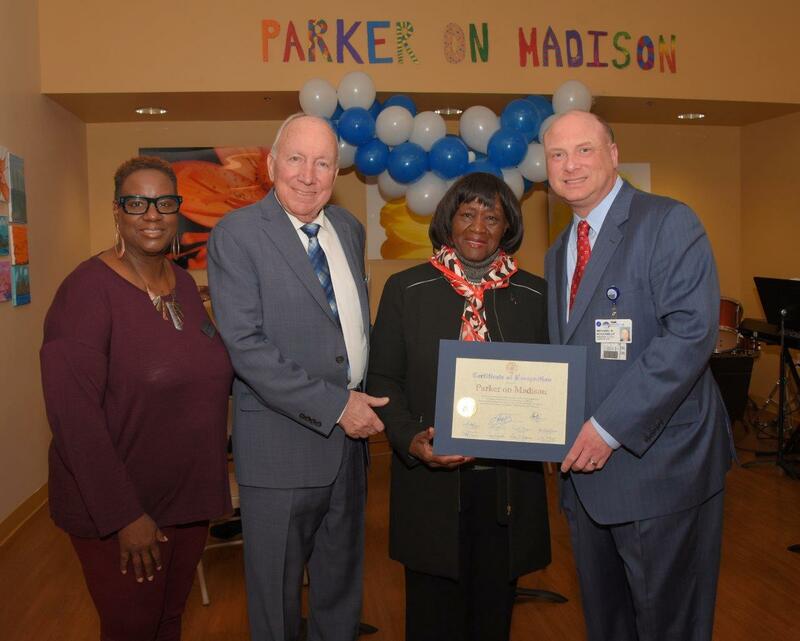 Parker features its own medical department, and is nationally renowned as a skilled nursing facility, as well as a provider of community-based health care, encompassing Social Adult Day Care, Home Health Care, Palliative Care and Hospice. Contact: Lina Scacco, (718) 289-2212 or lscacco@parkerinstitute.org.